The Maryland Transit Administration was originally known as the Baltimore Metropolitan Transit Authority, then the Maryland Mass Transit Administration before it changed to its current name in October 2001. The MTA took over the operations of the old Baltimore Transit Company on April 30, 1970. A former no. 8 streetcar, the predecessor to bus Route 8, at the Baltimore Streetcar Museum. This vehicle is now used to give rides to visitors. Many routes of the agency's current bus lines are based on the original streetcars operated by the Baltimore Transit Company and its parent companies between the 1890s and 1960s. All of these routes were ultimately converted to rubber tire bus operations, and many were consolidated, extended into newly developed areas, or otherwise reconfigured to keep up with the ridership demands of the times. Additional routes and extensions were added in later years to serve newly developed communities and to feed into Metro and Light Rail stations. With the growth in popularity of the private automobile during the 20th century, streetcar and bus ridership declined, and the needs for public transportation changed. Mass transit in Baltimore and other cities shifted from a corporate operation to a tax-subsidized, state-run service. The amount of service provided was greatly reduced. Some areas once served by streetcars are now served minimally by buses or not at all. The demise of the Baltimore streetcar took place between the years of 1947 and 1963, as operators found buses to be low maintenance and more cost-efficient. With its rails demolished, Baltimore was no longer a streetcar city. As transit needs and trends changed, rail transit did return to the city, with the Metro Subway opening in 1983 and the Light Rail in 1992. The track gauge was 5 ft 4 1⁄2 in (1,638 mm). This track gauge is now confined to the Baltimore Streetcar Museum. The Baltimore Transit Company (BTCO) was a privately owned public transit operator that provided streetcar and bus service in Baltimore from 1935. The company was purchased in 1948 by National City Lines and the streetcar system was then run down in favour of buses, a process repeated in many places, which became known as the Great American Streetcar Scandal. The last streetcar ran in 1963. BTCO was absorbed by what is now the Maryland Transit Administration in 1970. The BTC oversaw the elimination of streetcar service in favor of bus service in 1963 when the last streetcar routes, the number 8 providing service from Catonsville to Towson and the number 15 (Overlea to Walbrook Junction) were eliminated. In the midst of the Civil Rights Movement, the BTCO fired a white bus driver who claimed to be the Grand Wizard of the Baltimore Ku Klux Klan. A labor arbitrator ruled in favor of BTCO in this firing, which was in part spurred by other white drivers threatening to strike if the man was not dismissed. Old Court Bus Lines was a service that provided van transport in northwest Baltimore County. Its lines served places including Stevenson and Villa Julie College. These services have been provided by MTA since 1973, though much of them have been cut back or modified. Bus Route 60 serves Stevenson University, which used to be known as Villa Julie. Operated service in eastern Baltimore County. Most of its services later became a part of Bus Route 23. The only one still provided by MTA is service to Victory Villa, on Route 4. 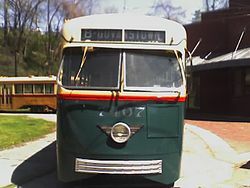 Dundalk Bus Lines provided service in various parts of southeast Baltimore County between 1940 and 1972. MTA serves some of these areas with Bus Route 4. Operated in northeast Baltimore County. The only route incorporated by MTA was Route 19A, which later became known as Route 105. Discontinued in 2005. Operated several routes during the 1960s. Most notably, Route H became known as the #7 Rosewood Express serving Rosewood Center for more than 30 years. The #7 Rosewood Express service ultimately became Route 102 in 2000, and was absorbed by Route M-17 in 2005. Route M-17, along with this service, was eliminated in 2009. Operated some of the routes around the city, such as what is now Route 51. Johns Hopkins Hospital 1948–1977 Routes 61, 62, 63 (now Route 64), and 64 Was split into four routes. Service today is provided in the Roland Park area by Route 61 (peak hours only), in East Baltimore on Route 35, and south of downtown on Route 64. Edgemere 1997–1998 not replaced Previously, Ft. Howard had been served by other routes including the #26 Streetcar, Bus Route 9, and the current Bus Route 4. Route 4 service was eliminated in 1993 and replaced by a private contractor. Route 6 restored MTA service there in 1997, but was eliminated a year later. Johns Hopkins Hospital 2008-2010 Routes 30, 46 West side service replaced with a new Route 30, which also serves part of the route of current Route 10. Eastside service replaced with Route 46 Quickbus. Essex 1972–1991 Routes 150, 160 Route 12 was the designation for express routes from both the western and eastern suburbs. The route was redesignated in 1991. BWI Amtrak 1993–1996 Route 17 Route 12 was formed in 1993 as a replacement for Route 230, which was eliminated in conjunction with the opening of the south end of the Light Rail. It also served a part of Route 17, which had been rerouted at the time. In 1996, Routes 12 and 17 were combined, with portions of both routes eliminated and not replaced. Kingsville, Perry Hall or White Marsh to Downtown Baltimore Overlea Belair Road 1973–1991 Route 43 (now Route 15) Was redesignated as Route 43 in 1991. Route 43 Kingsville service was merged into Route 15 in 1992. Route 43 White Marsh service was merged into Route 66 at the same time, but Route 66 was eliminated in 1993, and White Marsh service became a part of Route 15. Service between Overlea and White Marsh Mall/White Marsh Town Center is now provided by Route 58. Timonium 1973–1992 Light Rail Express trips were discontinued in 1992 along with the opening of the Light Rail. The Route 18 designation was used as a Timonium-Hunt Valley shuttle starting on that day, but it was later discontinued. Old Mill Road Glen Burnie 1993–1996 not replaced In 1995, service after 7 pm was discontinued. In 1996, line was completely discontinued due to low ridership. Dundalk Avenue 1958–1959 Route 10 (no Sparrows Point service) This route has recently been resurrected to serve between Downtown Baltimore and Dundalk Marine Terminal, including the new Amazon Distribution Facility on Holabird Avenue. Providence Road Park-and-Ride to Downtown Baltimore express service Towson 1976–1993 Shuttle to Light Rail Was an express service that operated through Towson, then downtown via I=-83. In 1992, along with the Light Rail opening, the number of trips were cut in half. In 1993, all express service was discontinued. A shuttle was formed in response to protests to total elimination. Washington Boulevard line Washington Boulevard Pigtown 1957–1959 Route 11 Merged into Route 11. Service is provided by Route 36. M-6 In 1984, service west of Mondawmin was replaced with "M-lines" during Metro's hours. In 1993, service south of the Cherry Hill Light Rail Stop was replaced with Routes 29 and 30 (which has since been replaced by Route 51). In 1996, all Monday-Saturday service was discontinued. Route 5 was modified to replace service in Reservoir Hill, Route 27 was extended to Cherry Hill, and service elsewhere on the route was provided already by other existing lines. In 2001, the remaining service on Sunday was discontinued when M-lines started to operate on Sundays. Ridgely's Delight 1950–1993 not replaced In 1992, service on this route was cut in half. When discontinued in 1993, no replacement service on route was provided, but other buses operate near entire route. St. Agnes Hospital 1987–2005 Routes 35 and 77 Service between UMBC and downtown merged into Route 35 in 2005 as part of GBBI. Service between UMBC and Halethorpe replaced by Route 77. Springlake Way & Bellona Avenue to Overlea Hamilton Northern Parkway 1970–1990 Route 66 Route 58 now serves this area, and Route 55 covers the portion of this line between McLean Boulevard and Overlea. Cheswolde to Downtown Cross Country Boulevard 1950–1989 not replaced Riders directed to take bus to Metro. Route 58 serves area and connects to Metro and Light Rail. Park Heights Avenue 1987–2005 Service to Villa Julie replaced by Route M-10 (now Route 60). Service to other parts of line not replaced. ^ "Department of Transportation: Historical Evolution". Maryland Manual Online. Maryland State Archives. Retrieved May 8, 2012. ^ a b c d "A Concise History of Baltimore's Transit". Baltimore Transit Archives. Archived from the original on April 8, 2002. Retrieved August 2, 2007. ^ "Railroad Gauge Width". Паровоз ИС. Российский железнодорожный портал. Archived from the original on July 17, 2012. Retrieved November 29, 2007. ^ Hilton, George W.; Due, John Fitzgerald (January 1, 2000). The Electric Interurban Railways in America. Stanford University Press. ISBN 978-0-8047-4014-2. Retrieved June 10, 2014. Worst of all, not all city systems were built to the standard American and European gauge of 4'-​8 1⁄2". 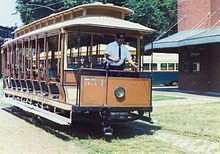 Pittsburgh and most other Pennsylvania cities used 5'-​2 1⁄2", which became known as the Pennsylvania trolley gauge. Cincinnati used 5'-​2 1⁄2", Philadelphia 5'-​2 1⁄4", Columbus 5'-2", Altoona 5'-3", Louisville and Camden 5'-0", Canton and Pueblo 4'-0", Denver, Tacoma, and Los Angeles 3'-6", Toronto an odd 4'-​10 7⁄8", and Baltimore a vast 5'-​4 1⁄2". ^ "A Brief History of Baltimore Streetcars". Archived from the original on March 6, 2012. In 1949, the National City Lines holding company gained control of BTCO. The NCL has long been accused of being a major player in the so-called 'Great American streetcar scandal', in which front organizations for bus manufactures, tire companies and oil suppliers acquired and dismantled streetcar systems in order to replace them with buses. Soon after the NCL takeover, BTCO began to replace streetcar and trolleybus lines with conventional buses. The 1950s saw decline of the once extensive system, as NCL cut back on service and car maintenance. ^ "Firm Upheld on Firing Klan Driver". Pittsburgh Courier. August 13, 1966. ^ Gary Helton (2008). Baltimore's Streetcars and Buses. Aracadia Publishing. p. 103. ISBN 978-0-7385-5369-6. Retrieved April 26, 2010. This page was last edited on 15 February 2019, at 22:02 (UTC).